What happens when there’s not enough waves and way too many surfers at the lineup in the Surfer’s Paradise of Siargao? I had to say, I haven’t. I never had the chance to try. It looked complicated. Did she just say abs? Count me in, then! We took about a half hour ride on a motorbike and the rest of our crew took a van. We represented, Korea, Russia, France, Spain and the Philippines with our motley crew. We arrived at Malinao in the municipality of Del Carmen around 2 PM, it was the perfect time to explore this forest mangrove until sunset. 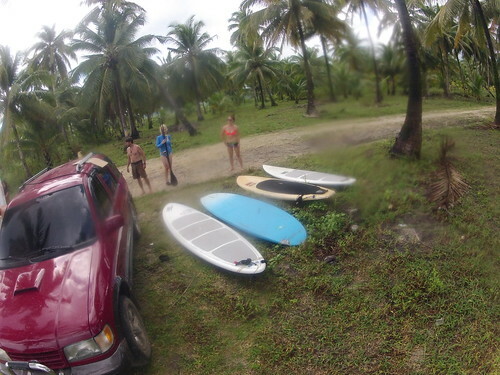 Enrique, co-owner of Turtle Surf Camp gave us an SUP crash course. The rest, we had to figure out ourselves. It was easier than I thought. It was no surprise that an SUP is much more buoyant than the short board that I’m used to. The key was to find balance on this bigger board and get used to paddling around. I have to admit, I fell quite a few times and got laughed at before I got the hang of it. But who didn’t? 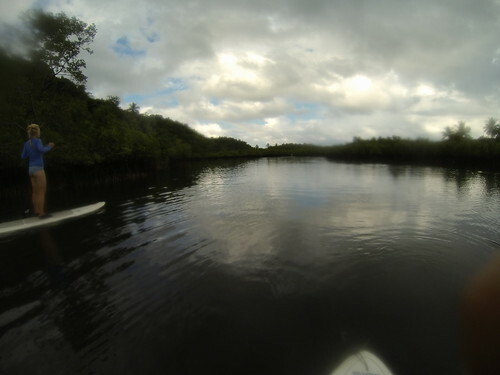 Paddling through the mangroves was a great way to enjoy our time in Siargao. We couldn’t help but take photos every few minutes. Not only that, it was a great combination of fun and exercise! I found out later that these mangroves are not a very popular tourist destination. You can say it’s still kept hidden, for now. This place is also a habitat of rare and endangered species of flora and fauna both in marine, wetland and terrestrial areas. So if you’re a fan of nature, you have to make this part of your itinerary. Another great thing about this tour is that our hosts, Kitya and Enrique knew the area very well. I would have felt very lost in a maze of mangroves had it not been for them! They also told us exactly how to paddle and showed us exactly where to go. It was very important because they knew the tides and the current. It was easy enough going around, but the challenge was that we were paddling against the current getting back. Another thing I enjoyed was that we could paddle at our own pace. No racing or showing off necessary. You could paddle slow and take in the sights in a leisurely manner. Or you can also paddle til your arms hurt! There were 4 people in our group so we had a guide for every 2 persons. The paddle back was the most fun part. The sun had already began to set. The orange light was glorious and the reflecting pool of water acted as a magic mirror that made everything look ethereal. 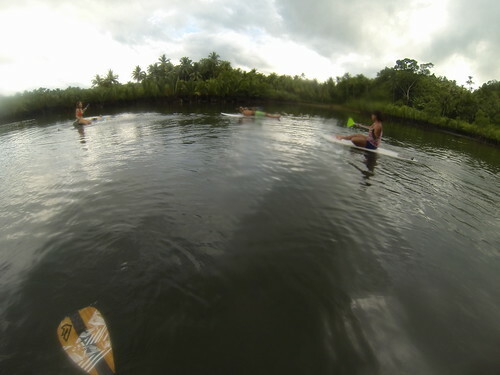 -Turtle Surf Camp Siargao offers the Malinao Mangrove Tour which includes: half day trip with transport (car/motorbike), SUP or kayak with guide for 1,500 PHP per head. 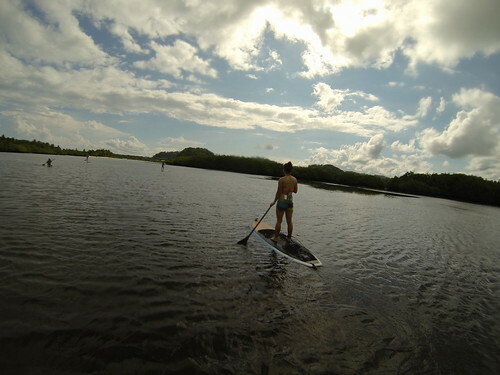 - Malinao is the perfect location for doing SUP as well as kayaking. You’ll be in for an adventure into the lush tropical mangrove forest and discover the island’s finest and most secluded beaches. 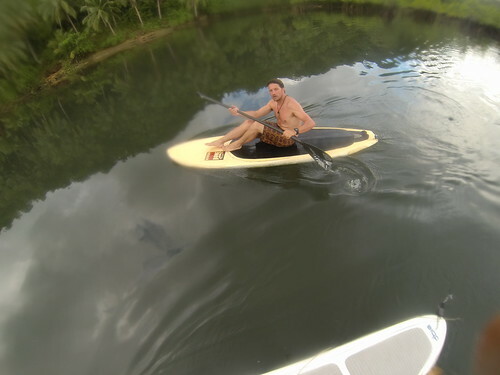 -The tour also includes visiting a rustic village, experiencing an amazing sunset while on a kayak, or SUP. If you’re lucky and you chance upon a full moon night, you can starting the journey at sunset to see planktons glow at night. 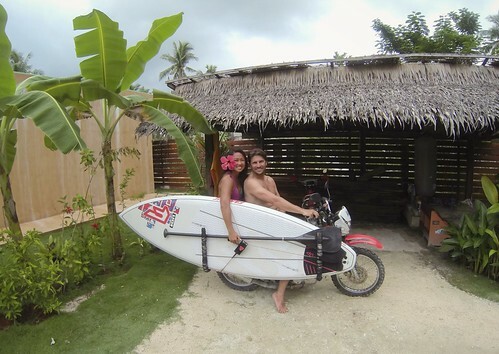 - As always, all Turtle Surf Camp trips have the fun and craziness guaranty! 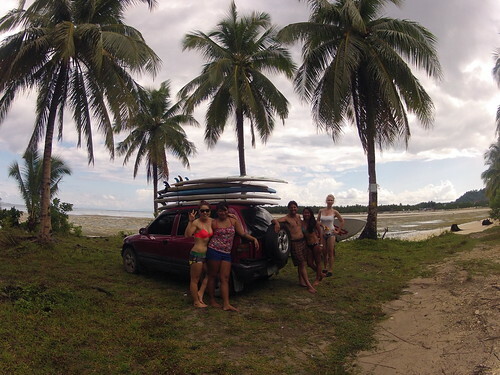 Book your tour with them through surfcampsiargao@gmail.com +63 939 569 2498. Look for Kitya or Enrique. 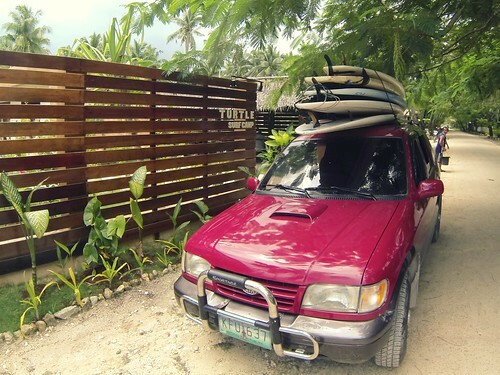 Special thanks to Kitya and Enrique of Turtle Surf Camp Siargao! Looking for more Siargao Adventures? Check our our Caob Lagoon Jumps and Island Hopping in Casulian Island!